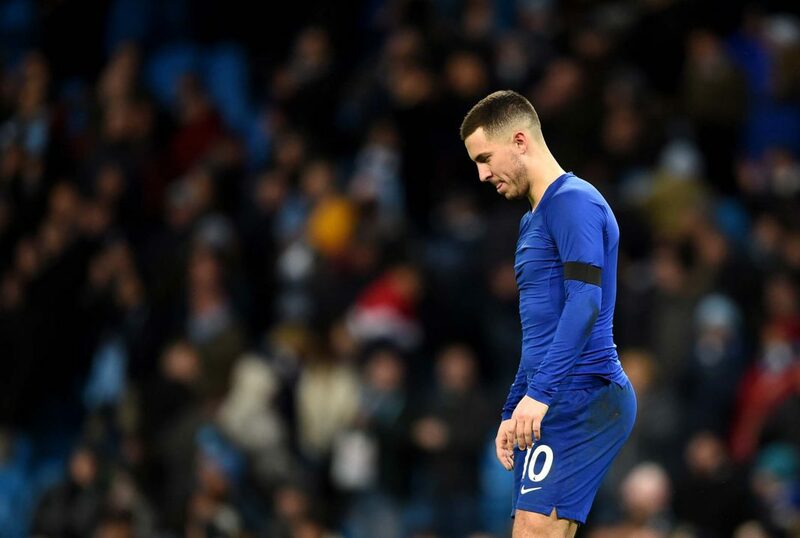 Eden Hazard reacts at the full time whistle after the Premier League match between Manchester City and Chelsea FC at Etihad Stadium on February 10, 2019 in Manchester. A freezing day had already led to a change of venue and it didn’t help the standard of the play but Conor Gallagher scored just before the break to earn us all three points. The women drew Arsenal in the next round of the FA Cup. The television companies sure do like a plumb tie. Joe Fascione who was a winger for us in the sixties has died at the age of 74. Joe played 34 time for us, scoring once after signing on from Kirkintilloch Rob Roy – possibly the most romantic name for a football club. Joe’s biggest impact at Chelsea was as one of the eight players sent home from Blackpool by Tommy Docherty in 1965 after they broke a club curfew. Football, being football, it never changes: two Southampton fans are going to be banned for making aeroplane gestures at Cardiff fans the day after Emiliano Sala’s body was recovered. Six-bloody-nil, six-bloody-nil! Twelve unanswered goals in three away performances that get more incompetent, more shameful, more inept as each week passes. Today we stood and watched as they flowed through our midfield and defence as if it wasn’t there. City scored four in the first 25-minutes. Raheem Sterling scored the opener and Aguero scored a hat-trick but to be honest they could have had double figures. We didn’t press City at all. We stood and watched as they passed around us. Pedro, Hazard, Barkley and Kanté were abysmal. They offered no resistance to City’s passing at all. Worse was Jorginho, the £58m midfielder cannot accept a pass under pressure, cannot tackle, cannot close down and this is the man Sarri built his team around. Everton rumbled it, they turned up at the Bridge, went away with a 0-0 as Richarlison and Gylfi Sigurdsson showed Jorginho up for the limited footballer he is. When you close down Kanté or Nemanja Matic they simply shrug you off and play through the problem. Jorginho folds up into his shell and starts flailing around, sometimes with his studs up. Sarri said afterwards that he had no idea why we had failed, again, and it is clear that he is not up to management at this level. However often he says that Barcelona always played their football wherever they went they didn’t get thrashed like this week after week. We slump to sixth in the table after our worst result since 1991. The club should look for a caretaker now. Perhaps Emma Hayes would step into the role after her women fought back from two down to draw. Ji So-Yun scored both our goals. To be fair they had a couple of chances on the break and fluffed their lines. In the end we’ve probably done Arsenal a favour.